The London office property market has cemented its position in top place among a host of prestigious global property markets for the third year running.Throughout 2014, several indicators suggested that the average cost of office floor space in the capital was rapidly rising. Take up rates rose consistently during 2014, and so did the level of transactions and the amount of office space under offer. This year, London has consolidated its position as the most expensive office market at international level, ahead of key global players like New York or Hong Kong. Take a look at the details behind the stellar performance of the London office property market. A recently released Cushman and Wakefield study entitled ‘Office Space Across the World’ published a comparison of rental costs between some of the world’s most desirable office locations, which in addition to London included New York, Hong Kong, Paris, Sydney, and Tokyo. 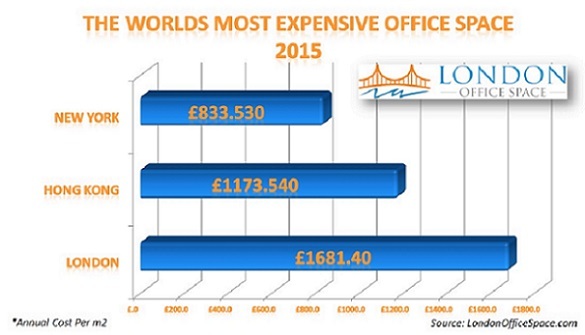 London came in top place as the world’s most expensive office market for three consecutive years. Over the past year, average office rental values in the city have increased by 4.6 per cent. The cost of office floor space in London is still far from returning to pre-recession values, as it remains 13% per cent lower than its 2007 values, but market analysts predict that the current trends are here to stay. As the availability of office space continues to decline, prices will rise even further throughout 2015 and beyond. The main reason behind this upward trend is the ever-shrinking gap between supply and demand. London’s reputation as a global business centre attracts both entrepreneurs and experienced business owners to the British capital, and the effect of unwavering demand on the commercial real estate market is obvious. In the West End, supply has been dwindling since 2007, and currently vacancy rates hover around 3 per cent. This has allowed landlords to rise prices accordingly, pushing average costs to a new record high of £1,681.40/ m2 per year. To put this figure into perspective, consider the average costs of prime office space in the world’s second and third most expensive locations. In Hong Kong, office space in the central business districts averages £1,173.54 / m2 per year, whereas in New York average costs are in the region of £833.53/ m2 per year. Increasing costs seem to be a global trend, since during the past year office rental values have grown by an average of 7 per cent across the major global office markets. Another important factor is that development levels have been rather low considering the high levels of demand for Class A office space. Speculative developments in the West End are at their lowest level since 2004, although it is expected that the situation will improve slightly with the 1.2 million square feet of new office space that are due to be released in 2015. The West End ranks first with average rental costs of 2,344 m2 / year (£1,443 sq m / year). Average prime rents in certain parts of the West End currently exceed £115 per square foot, especially in highly sought after locations like St James or Mayfair. For instance, in early April 2015, a 2,959 square feet office development in St James Square was leased at a record high price of £185 per square foot. According to Property Week magazine, this transaction has broken all records not only in London, but also at national level. In King’s Cross and Euston, office floor space is being leased at £67.50 / sq ft. Rents have also increased significantly in this area over the past 12 months, rising by an impressive 12.5 per cent in just one year. The price of prime office properties in Victoria has followed the same trend, rising by more than 10 per cent to reach average values of £77.50 / sq ft. Elsewhere in London, rental values have continued to increase, even if at a slower pace. For example, office space in the City Core now averages £62.50 sq / ft. Prices are expected to keep rising, as occupiers looking for properties in this area have shown a strong preference for higher-priced Class A space. Prices have also been rising steadily in what until very recently were considered fringe locations. This is the case of office space in Clerkenwell, Shoreditch, Whitechapel, and the Southbank, where property owners have seen an increasing number of businesses relocating to the area in search of more affordable rents. Rental values in these areas range between £46.50 and £55 / sq ft. The occupier profile in these areas consists mainly of companies involved in the technology and digital media sectors.